Winter is a blast in Big Bear. It is a wonderful time with the family and a vacation is always a great treat. Most of our guests prefer to stay in a Big Bear cabin that is close to Snow Summit or Bear Mountain. The rentals come in all sizes and are completely equipped. You'll find full kitchens, fireplaces and many are pet friendly. Sizes start at 1 bedrooms which is ideal for a family up to 4 people. Usually they will have one bathroom and a large enough living room. For 4-6 people you will need a 2 bedroom or a one plus loft. They'll have 2 bathrooms and with this size, usually you'll get something extra like a hot tub, a pool table or game table. The larger luxury accommodations are generally 3 or more bedrooms and this kind of lodging is perfect when 2 families want to share a place. You really get more for your money when you get a bigger place as the size really matters. If your family is into skiing and snowboarding, you will find that staying near Snow Summit might make the trip a bit easier. Snow Summit if the epitome of mixed use mountains. Some of the lodging at Snow Summit surrounds the mountain and there is always a trade off on price. The closer you are to the skiing, the higher the price, the further away you are the lower the price. That said, most people find the right accommodations and don't care so much if they are at a walk to the slopes property. Bear Mountain is the other ski resort and you'll find lots of Big Bear rentals that are a walk to the lifts, or set into the hillside with a view. The town is called Moonridge and is composed of hilly streets, forest or lake views and here you will transposed away from city life. It is much quieter and you will get that true mountain living feel. Both Snow Summit and Bear Mountain are connected by free transport so show up and one area, and you can ride the bus to the other. 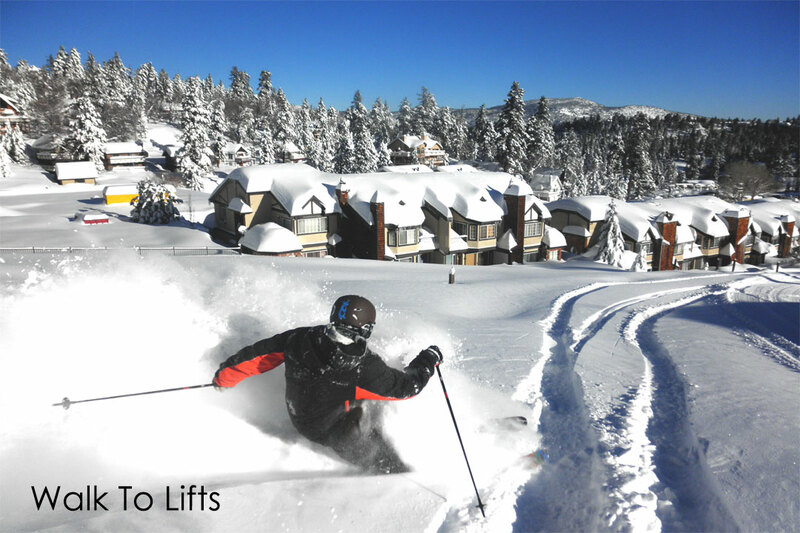 While skiing and snowboarding are the popular activities, more than 30% of the people who come to Big Bear in winter don't. They do other activities such as go sledding, build snowmen, race down the toboggan runs, or even go ziplining. Yes, you can zipline in the winter in Big Bear. But there is something to be said about sitting by the fire in a cozy Big Bear rental and reading a good book, or playing on your computer. During busy times, holidays, and special weekends, the best cabin rentals in Big Bear get reserved first. Guests who know, make their reservations early. Don't be left out in the cold!